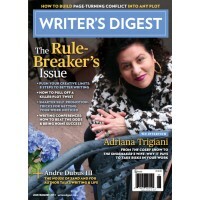 I just got the latest edition of the Writer’s Digest, which includes an interesting article entitled “The Bolt From the Blue” by Celia Johnson. The article features ten famous works and the “bolt” of inspiration that inspired their authors to write them, pulled from Celia Johnson’s book Dancing With Mrs. Dalloway: Stories of the Inspiration Behind Great Works of Literature. Tangent! Oddly, all ten authors in the article are men. In Adventures in Sci-Fi Publishing, I loved what N.K. Jemisin said about us all swimming in this patriarchal society, and how we all — male or female — have to be aware of under-representing half of the population. Ms. Johnson and Writer’s Digest could very well have selected a few of the great female authors from her book, which features Frankenstein (Mary Shelly), The Bell Jar (Sylvia Plath), Gone With the Wind (Margaret Mitchell), and Jane Eyre (Charlotte Brontë). We could take this one step further in regards to the ethnicity of the authors, as well. At any rate, back to my original topic: thanks to the families. As I was reading through these ten examples of great works, what struck me is how rude the authors sounded. Maybe it’s simply due to slight inaccuracies since they had to chop down these ten examples down to fit into a two-page article. Maybe it’s because we don’t really know when the bolt of creativity hit them, actually. L. Frank Baum was in the middle of telling a story to his kids when he was struck by the concept that turned into The Wonderful Wizard of Oz, so he interrupted his time with his sons to start writing. Washington Irving was in the middle of a conversation with his brother-in-law when he “dashed out of the room” to go write. His brother-in-law had been trying to cheer him up since he’d been suffering from writer’s block, so I suppose he couldn’t be too offended — after all, it worked. Gabriel García Márquez abandoned his vacation trip with his family so he could go write. They were on their way when he turned the car around! Now, maybe I’m being overly judgmental, but I finished reading the article thinking, it’s no wonder people think writers are antisocial. It’s not just that we avoid social situations, it’s that we interrupt them to go off and write, alone. And here I thought I was bad, refusing to answer the phone when people call me while I’m writing. So, I just wanted to say thanks to all the families of authors out there! Without your love, support, and understanding of their strange ways, we probably wouldn’t have gotten a chance to experience the amazing works by these creative minds. Tomorrow is also Memorial Day, so as an American, I’d like to say thanks to all the servicemen and women who have fought to keep our country safe, and to remember all the soldiers who made the ultimate sacrifice defending this nation. I’m so thankful to be able to sit unafraid in my home, pursuing cerebral flights of fantasy into worlds that will never be, through the pages of a well-written book. Thank you!